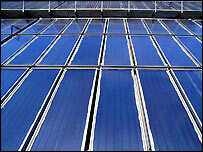 A bus shelter in Cornwall is to be lit using solar power as part of a council experiment. Solar panels will be fitted to the shelter at Cury on the Lizard Peninsula for a trial period. Cornwall County Council says other bus stops could be illuminated in the same way if the pilot scheme is successful. The shelter at Cury has been chosen for the trial because it is well-used at night and in an area where there is little street lighting. Solar panels fitted in the shelter will be charged during the day, the lights will then come on when passengers use it after dark. The county council said it is planning to install solar power at a second shelter in another part of Cornwall and during the winter officers will check if there is enough sun to provide adequate power. The parish council at Cury says it is delighted the village has been chosen for the experiment and says the shelter is well placed to be used by many local people.